Hey gang, Valkor here. And I’m beginning to see just where indie games fit into all things video gamedom – they make for the perfect middle man between AAA releases. That don’t mean indies should be shirked upon – nay I say! In fact, there's plenty to choose from and you’re never quite sure when you’ll come across a gem of a title. And speaking of gems, let’s take a look at Scram Kitty DX (original title: Scram Kitty and His Buddy on Rails) for the Playstation 4. 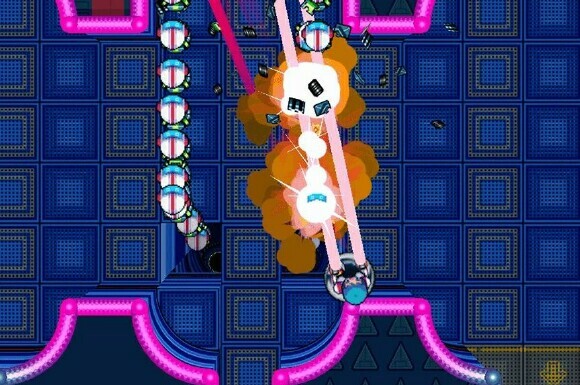 Scram Kitty DX is a 2D physics based puzzle/shooter on rails – literally! 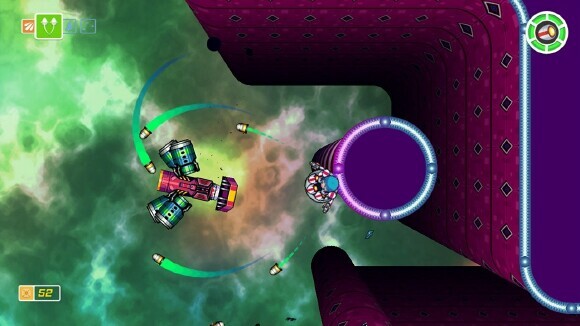 You take control of Buddy, who while piloting his spacecraft, must traverse a space laboratory in an attempt to save his friends scattered throughout. 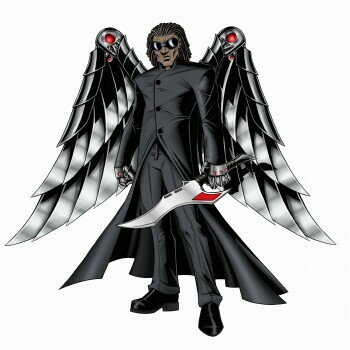 The craft can only ride on rails with his gun facing in one direction at any given time. Thankfully rails are everywhere as your craft can climb walls and ceilings, so shooting in a particular direction, will require some skill on your part. You also have a jump/double jump feature to attach to suspended platforms that you’ll automatically attach to. 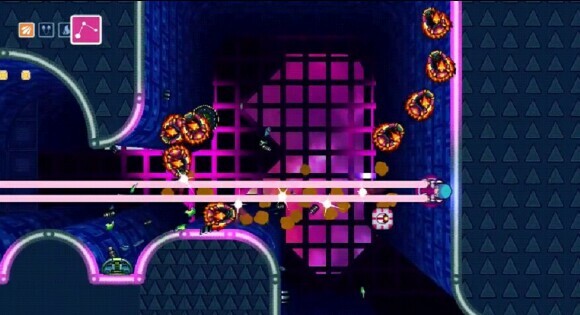 The double jump also acts as a way to wreck enemies or destroy certain objects. Once you reach a platform, you’re not only locked onto the rails by the ship but there's also a tether line that keeps you linked to any given platform should you jump too far away. Doing so will also perform a slingshot manuever that can shoot you to other platforms that may be out of reach of your double jump, so this is one move you'll need to quickly master. And if you jump to far, the tether can snap and you’re whisked away into oblivion, having to try again. 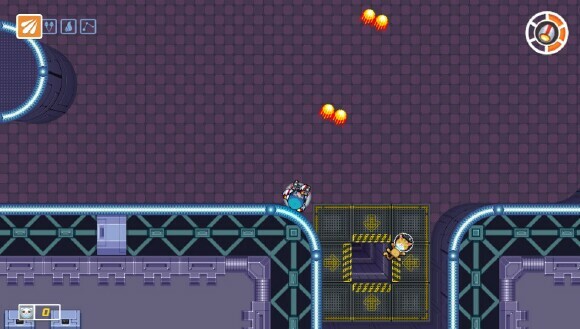 Each level commands its own set of difficulties including enemies as well as hazards such as spikes, laser beam barriers and such that will slow you down, keeping you from your objective. And your objective is all about getting your peeps out of this predicament; there are many ways Buddy can save his friends, primarily he can just touch them and they’ll go zooming to the exit. There are others that need to be unlocked by collecting a number of coins or you’ll have to guide them until they reach the exit. This poses something of a challenge for Buddy, since there are many obstacles in his path plus his limited direction in shooting. For instance, there is one type of cat that when you touch it, it shoots off to another part of the board and you’ll have to reach him within a certain time limit or he’ll return to the spot where he was and you’ll have to start all over again. It’s all about trial and error, but you’ll eventually figure out the path that works. The good news is, once you’ve saved a set number of kitty pals, you can move on to the next stage, which you can then go back and replay the level to finish the job. Scram Kitty DX is a game that seems simple at first, but as you progress you’ll see there’s a lot of depth and challenge within this title. But is it ultimately worth the price of admission? Absolutely! 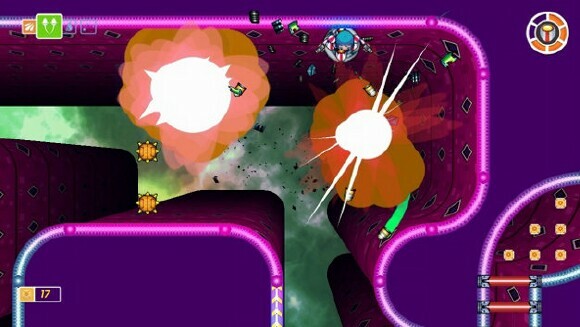 And for anyone who loves a challenge, then Scram Kitty DX is a definite pick-up! The game looks kinda cute and simple, but it’ll also test your patience and perseverance; the one aspect I thought would completely push me away from this game – the limited shooting direction – is the one part that I didn’t take too much notice once I was fully involved with the game and used to the mechanics. I became was more focused on getting to my pals rather than worrying about my position in shooting down enemies – it simply became an intuitive response. The graphics are solid and sharp with nice bold colors and neon that pops, which looks amazing and blends well with the setting. The animation is quite nice and fluid, where everything flows well. Now the controls will take some getting used to, but thankfully the game gently eases you in, with a nice tutorial. Once that’s done, you hit the floor running through each crazy level. The music is also fantastic, sweet and mellow; it’s not as frantic as I would have assumed or even cutesy, but you get a nice groovy techno-ish, club style beats. Scram Kitty DX is way more intense of a title than I expected, but thankfully it’s not that crazy that you’re unable to enjoy all of its complexities. 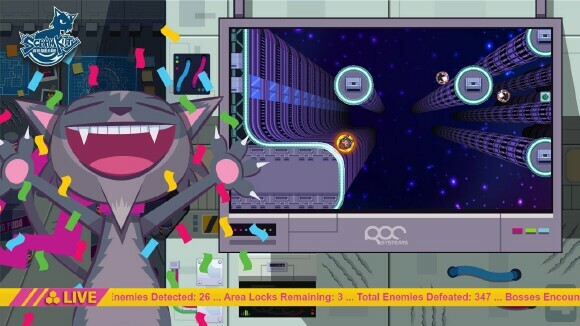 Though it starts out easy and increases difficulty with each passing stage, Scram Kitty DX is no slouch and even though it can get frustrating, it’s still a blast to play. It’s out now for the PS4 as well as the Playstation Vita, with Cross-Play support so you can continue rescuing those kitties on the go. And out of TOV 5 stars, Scram Kitty DX gets a solid 4.5.